The Peach-faced Lovebird is a beautiful 'pocket parrot'. They come in a variety of colors and are the most commonly kept lovebirds! The Peach-faced Lovebirds are one of three lovebird species that are very popular, affectionate, and readily available. The others are the Masked Lovebird and the Fischer's Lovebird varieties. If you obtain a hand-raised Peach-faced Lovebird you will have an incredibly affectionate friend. It is a most playful, intelligent, and amusing little bird. This small parrot is also an excellent beginners bird; being relatively hardy, easy to care for, a willing breeder, and reasonably priced. The Peach-faced Lovebirds are very social and love companionship. Their natural behavior is to live closely with a companion so are often kept with another lovebird. Though they make a very fine and affectionate pet when hand-raised, they will need a lot of attention if kept singly. Most are kept in pairs to satisfy their considerable need for constant companionship, mutual preening, and socialization. Agapornis roseicollisi catumbella There are over a dozen mutations of the Peach-fronted Lovebird. Some of them include yellow mutations such as the Lutino Lovebird and the cinnamon lovebirds; the pied mutations that began with a stunning contrast between the yellows and greens; blue mutations such as the Dutch Blue Lovebird and the Whitefaced Blue Lovebird; olive mutations; and from crossings of these has produced multiple color combinations to form many new varieties. Distribution: The Peach-faced Lovebird is native to southwest Africa in Nambia and southwest Angola. They inhabit dry areas with shrubs or trees bordering forests, usually near bodies of water. There are two Peach-faced Lovebird subspecies, the first being A. r. roseicollis which is thought to have been found in about 1817. The other A. r. catumbella was not discovered until 1955 and is distinguished from the first species by it's brighter greens and more pronounced red coloring. Description: The Peach-fronted Lovebird is a very small member of the parrot family, but is greatly admired for it's striking coloration. They have a general green plumage with more yellowish under parts. The forehead to behind the eyes, cheeks, throat, and upper breast are a rose-pink, being reddest on the head. The feathers of the rump and onto the upper tail are bright blue, and the tail also has occasional orange and black markings. The eye is dark brown, the beak is horn colored with a tinge of light green, and the legs are gray. The young have grayish-green feathers in the plumage. The rose-pink in front is paler and they don't have red on the forehead. The beak is often marked with some black. They acquire their adult plumage at about 4 months. Size - Weight: Though they are the largest of the lovebird species, the Peach-faced Lovebird will only get up to about 6" - 7" (16 - 18 cm) in length. A roomy cage is required as lovebirds are very active. If you have a tame pet that is kept in a small cage, it needs to be let out for extended periods to fly about. In the wild the Peach-faced Lovebird eats seeds and berries as well as agricultural crops, especially maize and millets. As a pet they will enjoy a variety of seeds, fruits, vegetables, and commercial pellets. Social Behaviors: In the wild they are seen in small flocks, and occasionally larger flocks when feeding in ripening crop fields. A lovebird is a very social bird with it's companion, and it is generally thought to be essential for their good health and happiness that they be kept in pairs rather than singly. They can, however, be aggressive towards other birds in an aviary setting. 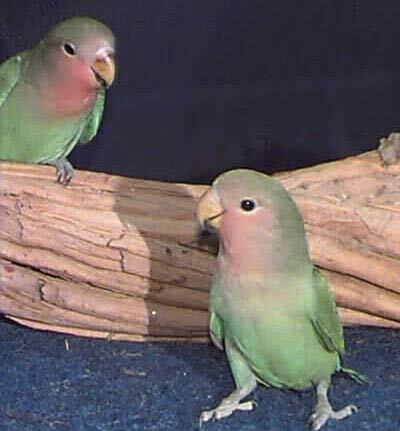 Breeding/Reproduction: The Peach-faced Lovebird is excellent for the beginning breeder. These birds will breed as either single pairs or in colonies, but they are much more prone to fighting in a colony setting so must be given plenty of space and more nest boxes than there are pairs of birds. In the wild these birds nest in crevices of cliffs or buildings, or take over the communal nests of weavers. When you provide them with a nest box, be sure to also provide lots of willow twigs, palm fronds, or other nesting materials as they will build a small nest of their own inside of the nest box. The female will carry the nesting materials between her back and rump feathers. Availability: The Peach-faced Lovebird is very popular and is readily available. I have a baby love bird who doesnt want to wean from handfeeding?? Is something wrong?? I have had my peach face love bird just over 3 years.He lets me stay with him.i am looking for a femail as close to home (Central lake mi. )as possible. HI. I would like to know how to cut the wings of my Peach- faced Lovebird which I just bought.Thanks. Trim my Love Birds for training. Not so they can not fly, just so they don't fly high where I can not reach them. From the long tip of the wing, count 5 feathers toward the body. Trim strait across from the 5th feather out to the longest heather. It is good to have a container of KWIK STOP Styptic Power. Good for nail trim and feather trim. Never know when an accident happens! Hello, I want to by birds, but I cannot open your Website address. Please contact my email.